Definition at line 48 of file llfloaterauction.h. Definition at line 72 of file llfloaterauction.cpp. References LLUICtrlFactory::buildFloater(), LLPanel::childSetAction(), LLPanel::childSetCommitCallback(), LLPanel::childSetValue(), LLControlGroup::getBOOL(), gSavedSettings, gUICtrlFactory, onClickOK(), onClickSnapshot(), and LLSavedSettingsGlue::setBOOL(). Definition at line 88 of file llfloaterauction.cpp. Definition at line 139 of file llfloaterauction.cpp. 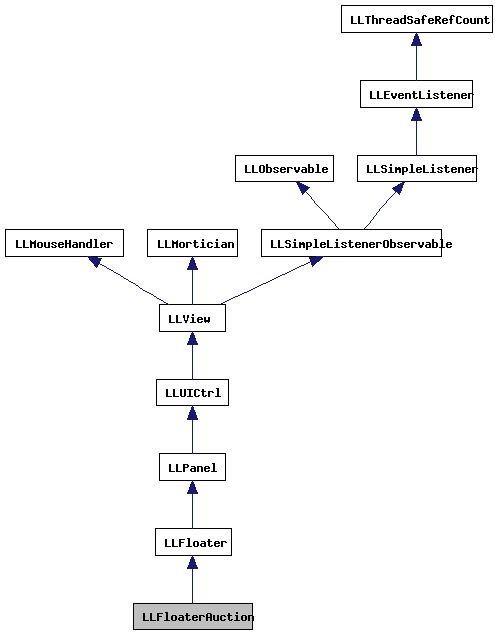 References LLPanel::childGetRect(), LLFloater::draw(), f, LLRectBase< Type >::getHeight(), LLView::getVisible(), LLRectBase< Type >::getWidth(), gl_draw_scaled_image(), gl_rect_2d(), LLFloater::isMinimized(), LLRectBase< Type >::mBottom, mImage, LLRectBase< Type >::mLeft, LLPointer< Type >::notNull(), and LLRectBase< Type >::stretch(). Definition at line 106 of file llfloaterauction.cpp. References LLPanel::childEnable(), LLPanel::childGetText(), LLPanel::childSetEnabled(), LLPanel::childSetText(), LLParcel::getForSale(), LLViewerRegion::getHost(), LLParcel::getLocalID(), LLParcel::getName(), LLViewerParcelMgr::getParcelSelection(), LLViewerParcelMgr::getSelectionRegion(), gParcelMgr, LLHost::invalidate(), mImage, mImageID, mParcelHost, mParcelID, mParcelp, NULL, LLStringBase< char >::null, and LLUUID::setNull(). Definition at line 213 of file llfloaterauction.cpp. References LLMessageSystem::addS32(), LLMessageSystem::addUUID(), LLAssetType::AT_IMAGE_TGA, LLAssetType::AT_TEXTURE, auction_j2c_upload_done(), auction_tga_upload_done(), FALSE, gAgent, gAssetStorage, LLAgent::getID(), LLAgent::getSessionID(), gMessageSystem, LLMessageSystem::newMessage(), LLMessageSystem::nextBlock(), NULL, LLMessageSystem::sendReliable(), LLNotifyBox::showXml(), and LLAssetStorage::storeAssetData(). Definition at line 168 of file llfloaterauction.cpp. References LLAssetType::AT_IMAGE_TGA, LLAssetType::AT_TEXTURE, FALSE, gAgent, LLAgent::getSecureSessionID(), LLViewerWindow::getWindowHeight(), LLViewerWindow::getWindowWidth(), gForceRenderLandFence, gVFS, gViewerWindow, llendl, llinfos, llwarns, LLViewerImage::MAX_IMAGE_SIZE_DEFAULT, LLViewerWindow::playSnapshotAnimAndSound(), LLViewerWindow::rawSnapshot(), TRUE, and LLVFile::writeFile(). Definition at line 52 of file llfloaterauction.h. Definition at line 94 of file llfloaterauction.cpp. References LLFloater::center(), initialize(), LLFloaterAuction(), LLFloater::open(), LLFloater::setFocus(), sInstance, and TRUE. Definition at line 71 of file llfloaterauction.h. Referenced by draw(), and initialize(). Definition at line 70 of file llfloaterauction.h. Definition at line 74 of file llfloaterauction.h. Definition at line 73 of file llfloaterauction.h. Definition at line 72 of file llfloaterauction.h. Definition at line 69 of file llfloaterauction.h. Definition at line 66 of file llfloaterauction.h. Referenced by show(), and ~LLFloaterAuction().